As some of you may know, I recently picked up the oldest 928. This is not the Number Six I've been working on and writing about, but a recent acquisition - Number One. 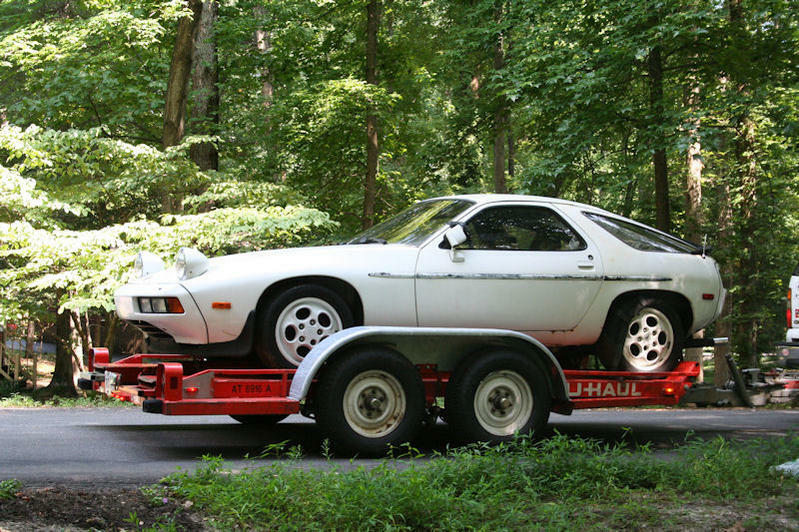 That's right, the earliest pre-production 928. Also a factory press car and Weissach test vehicle. Carries a very similar early history to #6. Fraternal twins born minutes apart, in late February 1977. 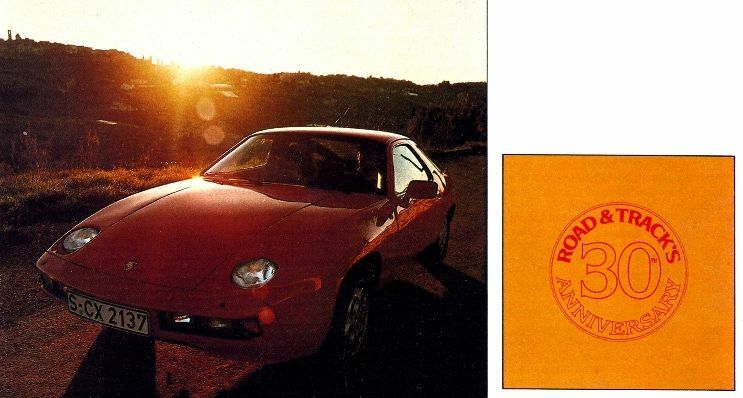 Reading through Brian Long's Porsche 928 book, I saw a striking Guards Red show car used at the '77 Geneva Auto Salon. 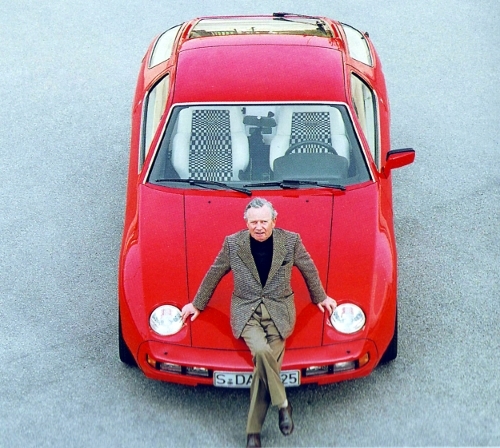 You may remember the photo with Ferry Porsche posing on its hood, with the custom bright white Recaro seats. What a cool car with clean lines and uncluttered appearance! This is what piqued my interest for the early cars. I became curious if this car still existed. Did Ferry own it? Is it still in the family, stored in a garage up in the hills of Zell am See? In the meantime, I had this crazy idea to find an early 928 in need of restoration (not hard to do), and restore it as a replica. I wanted a tribute to the Geneva show car and early 928's! As time passed, I continued to slave away (ha! ) at fixing up my pearl '87 S4. Out of sight - out of mind, but the early car was still in the back of my head. Just following the Boston Sharks Party '10, scanning Rennlist at Carl's (Ispeed) house, I came across an ebay ad for a Guards Red OB. I say to Carl, "ya know, I've always wanted to restore an OB." I tell him about my Geneva car idea. He replied bluntly, "no one knows what the hell is a Geneva show car!?" Looking a little more closely at the ad revealed a car with an early VIN. I thought, this is interesting, but really didn't have any idea what I was looking at. So I decided to follow it. And starting digging through my 928 books. I began to learn about the early 928, at it's place in Porsche's history. Not long after, I found a great early Road & Track article by Joe Rusz. It was their first driving test of the 928. And in that article was a front-on shot of a shiny new red 928, looking really good posed in front of a French sunset. What if the car in the photo what the same car for sale on ebay? License plate read S-CX 2137. Days later the VIN checked out to be an early car, and I prepared to make a deal with the seller. Out of nowhere, and literally without asking, the seller sends me a cell photo of a Porsche document. On that letter from Porsche read Factory Company Car (S-CX 2137). My heart skipped a beat. This was the Road & Track car! We made a deal, and I took delivery of Number Six a month later. I was hooked. In my seemingless endless search for NOS parts and hard-to-find used early car parts, I find myself hopelessly addicted to scowering Craigslist and Ebay. I'm attracted to any ad that reads 78 Euro, and call on most everyone I see. Matter of fact, Rob (Bronto) sends me CL ads semi-daily. Most often I ask for the VIN. Sometimes sellers have it and are kind enough to offer it. So the other day, Chris (Landseer) sends me a lead for a 77 928. Typically, I've found 77 to be a typo, but was particularly interested in this typo because the ad also read No AC. Don't see that too often. I leave a message with the seller. Hours later, the seller calls. Out of habit, my first question, "may I have the VIN?" He readily offers up 9288100011. I can truly say I wasn't expecting to hear what I just heard. I asked him to repeat it, to which he did. See, my #6 is VIN 9288100016, so I knew right away what I may be looking at if the seller was legit. I knew that four cars earlier than mine were painted Gran Prix White. So I casually asked the seller the car in question's color. His response equally met my hope. I was esthatic! So I pretty much on-the-spot offered to buy the car. The car that should be the first pre-production prototype, press car. I needed to do my due dillegence. In the case of a car like this, it's pretty straightforward. I asked the seller to verify the engine, and within a short time, had a match. Numbers matching. I'd already documented all 11 of the press cars, so I quick search revealed an early white car with license number S-CX 2132. I think we have a match. Took delivery of Number One, two days later. Last edited by Jadz928; 02-03-2012 at 06:08 PM. So here I sit, thinking to myself how I need another 928 restoration like I need a kidney stone. Seriously though, I'd been working on a plan to present to all you enthusiasts out there - those who get a kick out these OB's, restorations, or even 928's in general. When Number One came into my keep, I knew I was meant to put this plan into motion. 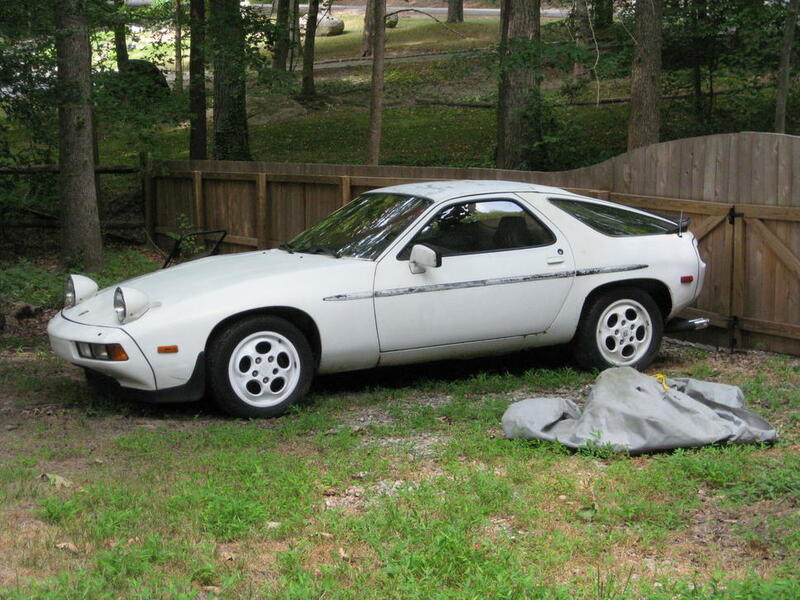 I want to develop a community restoration project to restore the first pre-production 928, Number One. I believe it's possible to put together an amazing team to pull it off. I'm accepting applications for volunteers to fill postions for the Number One Restoraton Committee (#1RC). The purpose of the #1RC is to document the restoration of this special Porsche, to establish standards and/or guidelines others may follow in the restoration of their early 928. Please send an email to [email protected] briefly (or not so briefly) stating your interest in the project. What position or role do you want to take on? How much time might you be willing to offer? Your phone number and best time to call? Following preliminary discussion with all applicants, I will send a project prospectus for review and refinement. This will include a basic framework for how we may go about doing this. Once the committee is in place, said committe will further develop said prospectus into a working plan. I have no intent to profit from this project. My ultimate goal is to continue to foster interest in early 928's. I also have interest in further saving Number One. There are potential future ideas for this project and beyond, but we'll have to cross those bridges when we get there. For those of you who have made it this far, thanks for you interest. I look forward to hearing from you. "Eleven cars were duly built for the 1977 Geneva Show and press fleet duty, the final one being completed 22 February..."
Confirmed by license plate shown in picture, S-CX 2132, where all press cars are documented chronologically. 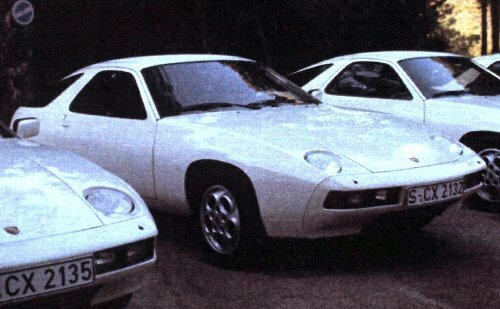 "only eleven pre-production prototypes had been built for the Press Launch, most of these had been commandeered for further testing at Weissach..."
The following letter from Porsche states "11th car built of the 928 series". 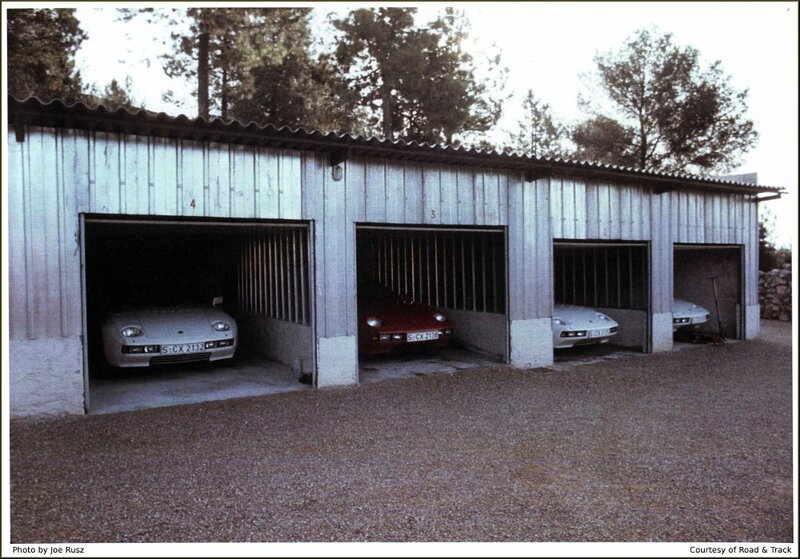 However, I cannot find record of earlier 928's built, other that prototypes. 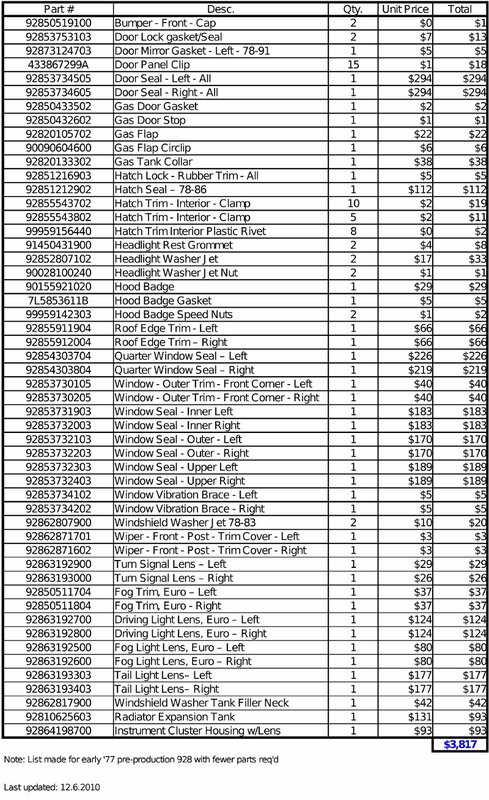 EDIT 9/30/2011 - Porsche has confirmed model/year 1978 started at serial number 0011. For more information on early MY 78 VINs, see Post #77 of "Master VIN Thread"
Last edited by Jadz928; 02-03-2012 at 06:10 PM. I've set the goal for a 95-98 point concours quality restoration. High level of respect given to preserving originality, as it left the factory. Liberties will not be taken. This will be a "down to the chassis" rotisserie restoration. Car will be disassembled in a "reverse order" to how it was assembled at the factory. The interior will be removed and inventoried. Seats and trim will be reupholstered with period correct material of original color and quality. Engine, transaxle and suspension will be removed and inventoried. Engine and transaxle to be sent a reputable professional for a complete rebuild. Both to receive a cosmetic refresh on par with factory finish. Chassis will be stripped and parts inventoried. Sound insulation and undercoating will be left intact where it makes sense. Chassis and associated parts to be sent for body and paint. Body and engine bay to be painted to factory finish. Original galvanizing to be left intact where applicable. Assembly order to be similar to how it was assembled at the factory. Engine, transaxle, and suspension to be subassembled using a jig similar to the factory jig. Chassis to be reassembled to engine/trans jig. Interior to be refitted with NOS Silverknit carpet installed. All seals and trim to be replaced with new or refreshed, to include all lighting glass and lenses. Most, if not all components will be replaced with new (NOS), rebuilt to "factory new", or refreshed. Serious consideration will be given to working with original components where it makes sense. If parts are replaced, they will be replaced with period correct from same year of manufacture. Phone dials will be painted with original color. I chose to have all major components (paint, engine/trans, upholstery) restored by professionals because it is the right thing to do for this car. I'll take care of logistics, procurement, finance, grunt work, cleaning, reassembly, and small projects. The car will NOT be driven while I own it. This will be an historic vehicle to be preserved and used as an early 928 restoration example. My hope is the #1RC will be involved with research, documentation, and decision making.... and wherever else it makes sense to establish standards or guidelines others may follow. - door seal, NOS, early style w/no "drip lip"
Should front windshield may remain in situ to preserve originality, or risk removal? Single stage vs. Base coat/Clear coat? Is waterborn paint even an option? Anybody know anything about ca. 1970's Sliverknit carpet? Is the modern "shorter-cut" Sliverknit acceptable, or does a "thicker-cut" variant, more similar to the original need to be found? Should any safety related TSB updates be performed? ie. Later steel vs. Early aluminum? Does odometer miles remain preserved or reset? How do you decide what parts need to be replaced with new? Very cool Jim..... I have recently gotten the bug to go find an early 928..hoping to find a decent 78 for a total resto back to stock... I like the 78 just because of the subtle differences between it and the 79..as well as being the first 928 . Now I just need to get rid of a couple non-928 projects..and then start searching for the right 78.. Very cool! Congrats on the find, I think you won the lottery!! I love it. I have #206, and the amount of brazing and handiwork on it has always been amazing to me. Good find, and so glad it is going to receive the recognition and treatment it deserves. This is way cool, I don't have anything to offer other than my congratulations. I'm looking forward to updates and seeing the completed project. What a great project. I look forward to hearing more about it. Awesome Jim and it could not be in better hands. Keep up the awesome work and keep the updates rolling. If this is going to take place in Richmond...you are close enough for some occasional weekend trips for me. I make a mean cup of coffee and would be glad to come up and "assist" any way I can. BTW, left you a message, I have been stacking up some early stuff you my want, holding off on listing it till I talk with you. Found the other side of the early bumper cover "underliner" part and forgot I had some of th early "non-carpeted" tool kit covers...and more. Congrats on the scrore, and for taking on this type of "project"!! If there is anything you think I would be of help with, just give me a shout.